Summary and Definition: The Chickasaw tribe of northeastern Mississippi were known for their brave, warlike and independent disposition. They were regarded as the most formidable warriors of the Southeast and referred to as the "Unconquered". The Chickasaw were farmers, fishers and hunter-gatherers who undertook long excursions throughout the Mississippi valley region. What was the lifestyle and culture of the Chickasaw tribe? The Chickasaw tribe are descendants of people called the Chickemicaws, who were among the first inhabitants of the ancient Mexican empire and the Mississippian culture. These ancient people built earthwork mounds at their villages located throughout the Mississippi River valley (refer to the Natchez Tribe for more facts). The Chickasaw people established villages across the Deep South and used dugout canoes to travel along the rivers and waterways. Their numbers diminished due to the diseases brought by the Europeans including the Spanish, French and British. They allied with the British against the French who attacked the Chickasaw in numerous military expeditions, attempting to break the stranglehold the Chickasaw imposed upon French commerce on the lower Mississippi. The French were defeated by the fierce warriors on every occasion. Following the War of Independence the 'civilizing programs' began. Many Chickasaw people adopted European practises such as European style dress, housing and farming techniques but were eventually sent to reservations. The Chickasaw tribe became known as one of the Five Civilised Tribes who also included the Cherokee, Creek, Choctaw and Seminoles tribes. Where did the Chickasaw tribe live? The Chickasaw are people of the Southeast Native American cultural group. The geography of the region in which they lived dictated the lifestyle and culture of the Chickasaw tribe. What did the Chickasaw tribe live in? 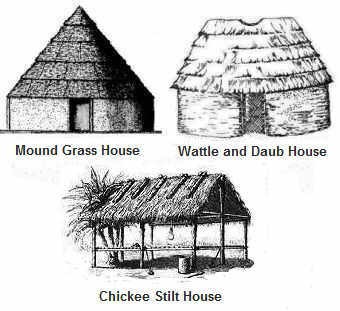 The Chickasaw tribe lived in different types of shelters over the years. The Mississippian culture people built earthwork mounds at their villages with grass houses. As the Chickasaw people lived a semi-nomadic lifestyle on the Mississippi flood plain, they built their houses on stilts called Chickees. Chickee stilt houses had no walls, they consisted of thick posts supporting a thatched roof and a flat wooden platform raised several feet off the ground and built along river banks, marshes and waterways. Villages consisting of Wattle and daub houses were sometimes built as winter homes. The American settlers brought new ideas and sharp tools that replaced the stone axes, and some of the Chickasaw began to build villages of American-style log cabins. Chickasaw villages were fortified by palisades to guard against attack. What language did the Chickasaw tribe speak? 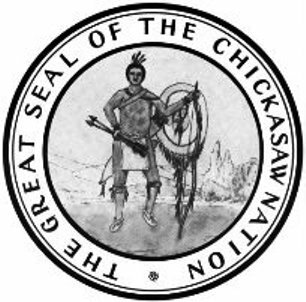 The Chickasaw tribe spoke in in several related dialects of the Muskogean language family, similar to the Choctaws. What did the Chickasaw tribe eat? The food that the Chickasaw tribe ate included included their crops of beans, corn and squash. Chickasaw men also hunted deer, bear, wild turkeys, small game and fish obtained on long hunting excursions throughout the Mississippi valley region. Some even travelled to the plains to hunt buffalo. Their diet was also supplemented with a variety of nuts, fruits, and herbs. What weapons did the Chickasaw use? The weapons used by the Chickasaw Native Indians included war clubs, knives, bows and arrows, maces and axes. The Europeans introduced muskets and then rifles. The war-like Chickasaw had numerous enemies including the Choctaw, Creeks, Caddo, Kickapoo, Shawnee, Osage, Quapaw and Yuchi. The Chickasaw were great military strategists and their strength was to employ unexpected tactics. The Chickasaw people believed that the ghost of a dead warrior would haunt his relatives until he was avenged. The Chickasaw always sought retaliation and revenge - the only question was when and where. What clothes did the Chickasaw wear? Chickasaw clothes were primarily made from buckskin. The men wore breechcloths with thigh-high deerskin boots. The women wore a knee-length dress. The Chickasaw removed all body hair and made extensive use of tattooing and body paint. The warriors wore a scalp lock with a roach style headdress adorned with feathers. The most honored Chickasaw warriors wore a mantle of swan feathers. By the 1800's the Chickasaw were greatly influenced by the American style of dress and the availability of trade cloth. Chickasaw History: What happened to the Chickasaw tribe?